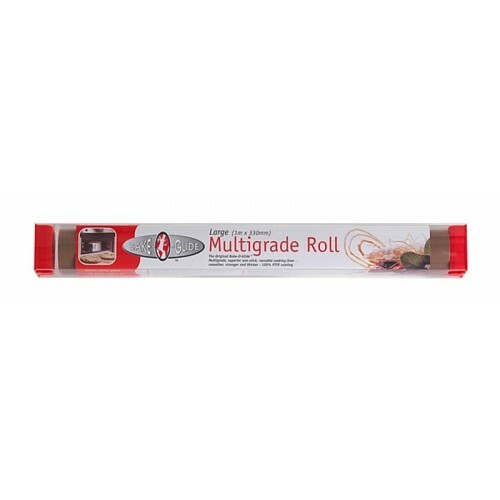 The Bake-O-Glide Large Multigrade Roll (1m x 330mm) is a multigrade, superior non-stick, reusable cooking liner which is smoother, stronger and thicker - 100% PTFE coating. The multigrade oven liner is the most versatile product in the Bake-O-Glide range. It can be used for baking, roasting, grilling, frying, microwaving, freezing and much much more. As with all Bake-O-Glide products no fat, oil or grease is required! The product is easy to clean, dishwasher proof and can be used 100's of times over.